In my previous post ‘Sponsoring a child’ I chose a picture of a door that belongs to the convent and church St. Pankratius of the Augustinian order in Hamersleben in Saxony-Anhalt County. St. Pankratius is now under renovation and will be finished in 2008. It belongs to the most significant Romanic facilities. Construction started about 1111 and the church was finished circa 1141. I chose this door because my great-grandfather lived in Hamersleben, and my grandmother belonged to a religious order before she married in her late thirties my grandfather who was then in his fifties. At the moment my information about my grandmother is very scanty, but I know that she was a deaconess before she married my grandfather in December 1918. After my grandmother had married my grandfather, she worked as a district nurse in Warsleben/Ausleben. Last year in fall, I toured this area for a couple days. Though I don’t know of any living relatives in this area at this moment, I love to visit this area because of my childhood memories. In the fifties I visited a few times with my father his mother, while she was still living in Warsleben, a town that is nearby Hamersleben. I found Hamersleben quite intriguing. Right next to each other are two separate churches. One belongs to the Protestant and the other to the Catholic religion. Since St. Pankratius is under renovation I couldn’t go inside the former convent. I just walked around that place and took some photos. But I’m looking forward to my next visit. 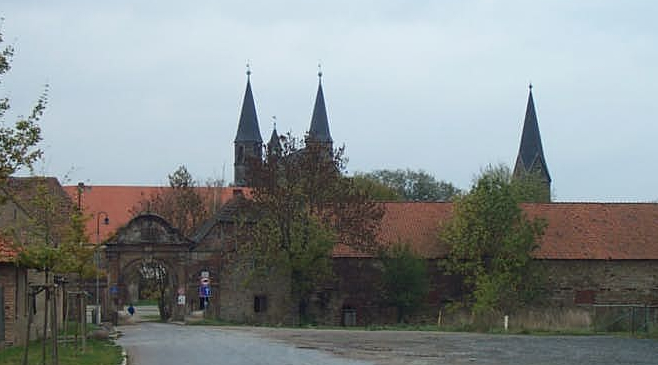 This entry was posted on Friday, June 8th, 2007 at 8:24 pm	and is filed under Ancestors, Saxony-Anhalt, St. Pankratius, Travel. You can follow any responses to this entry through the RSS 2.0 feed. Both comments and pings are currently closed.